Good Morning! 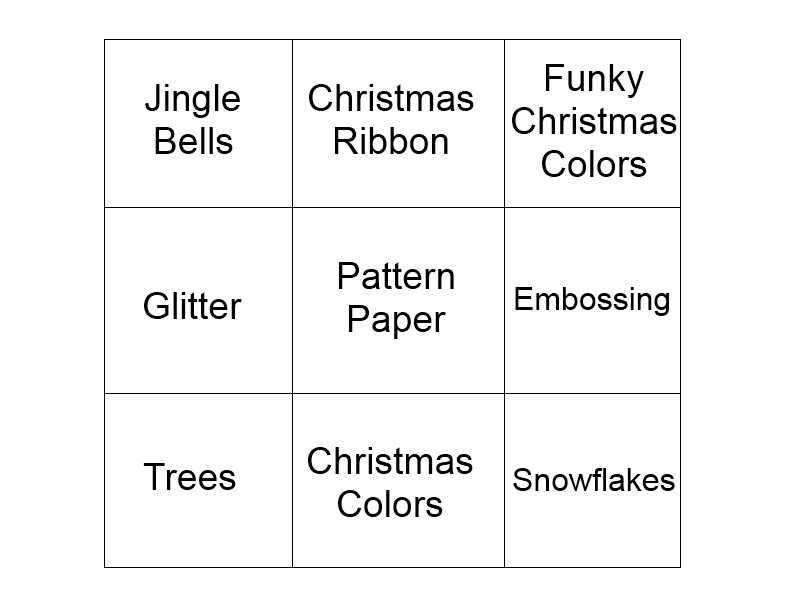 I am so glad we're back with the Pretty Patterns challenges. 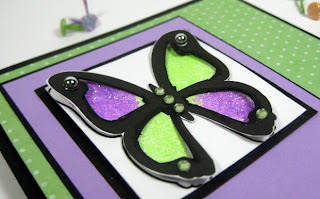 I have been looking forward to playing with this sketch and glitters! I hope you like this. I printed an outlined image and cut it out into a 2" base. This is where I added glue and glitter. I fussy cut the detail image of the butterfly and the blacked out the white card stock with a Copic marker #100. Looking at it close up isn't so pretty, but it accomplished what I needed. 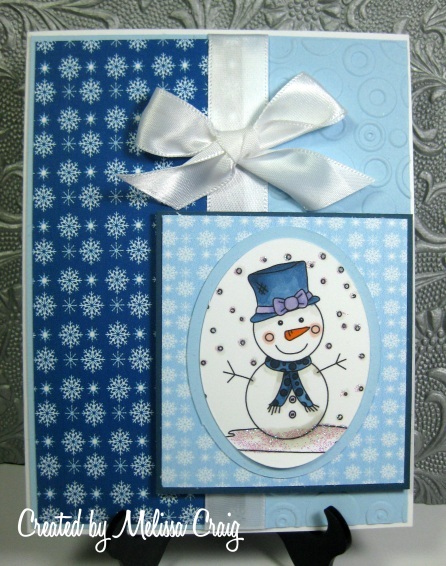 Then I put my card together and finished it with ribbon, a couple of cheater bows (see this great video from Fabulously Artsy) and a sugar-coated brad. I then added a lot of bling. Not only the glitter that I've been dying to use, but added silver pearls I got from the $1 bin at Joann's and green rhinestones that I was given from Simon Says. 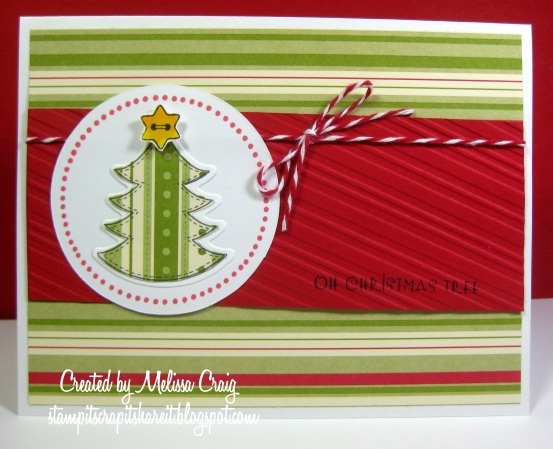 My card also fits the challenge over at iCopic Lover. I think I did an over the top amount of bling with all the glitter and rhinestone. I hope to see you play along with us this week. 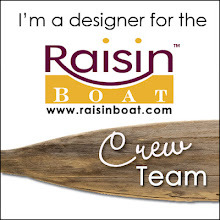 Click here to find how to join us. This is the last day of my mini vacation. I have really enjoyed being off with the kids and it was a much needed break. So Friday is our holiday potluck and gift exchange. Lucky me, I drew my boss' name and I really thought she would be easy to do a gift for. Well, she's not.... she's got some pretty expensive taste. I couldn't find Betsy Johnson jewelry in my price range so I decided it wouldn't be a gift from me if I didn't make something. So here's what I made. So, I found this tutorial on SCS for a Stationary Box. I read the directions, watched Beate's 2 videos and decided this is what I had to do. I found some coordinating papers, die cuts and stickers in this stack of paper that my friend Renee gave and I went to work. This was relatively easy and fairy quick, I ran into only a couple of snags. 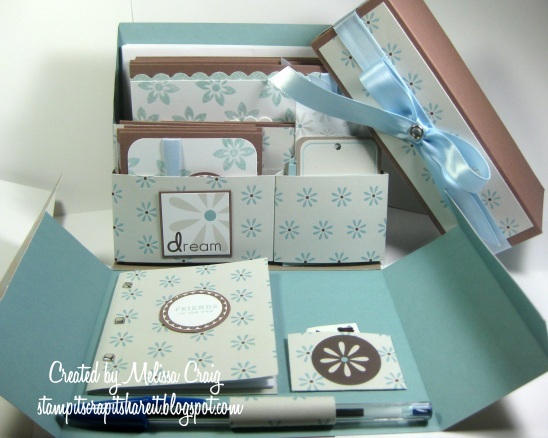 There are A2 size cards (6 + envelopes), 3x3 note cards (6), some tags (die cuts), a little book for addresses, a pouch for postage stamps and a pen. Have you noticed that, even though we're card makers, the art of writing to someone is being lost. I, personally, love getting cards and letters in the mail. Its refreshing to hear from someone rather than look at another utility bill or car note. I did make them look the same, but just changed the greetings a bit to give her some variety. I know I will definitely make more of these. This was fun to do and I really love this idea. I thank you for stopping by. Good Morning! Thank you so much for coming by. I get to post another Paper Pretties card and that's because sweet Heather is sponsoring TMS this week. Yay!! Our sketch was created by Marie and it's fabulous. 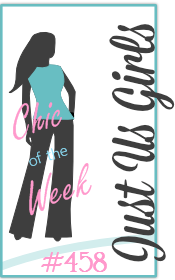 I am also playing along with Just Us Girls this week. Their color combo is this week which is Red, Olive and Kraft. Please come play with us! 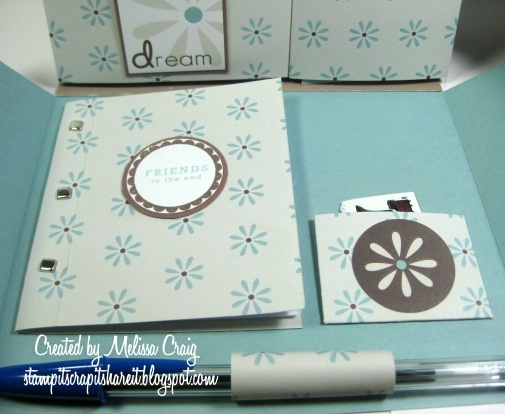 It'll combine well with Paper Pretties color combo challenge, too. Good Morning! Here we are, another week to begin and only 6 shopping days left to Christmas. Are you last minute, like I am? This year Christmas is rather slim, so there's not a lot of shopping to get done. I am making something for my oldest son, which has been interesting to keep it hidden. My choice was just a splash of green. I used one of Penny Duncan's Shaplies and then pierced holes around the frame and stitched with Baker's Twine. 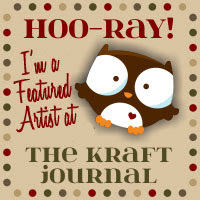 I love this new image by ARTish. Her name is Emalina, so darn cute!! Hello again. I'm back here to share a new card using this week's sketch from My Time Made Easy Pretty Patterns. 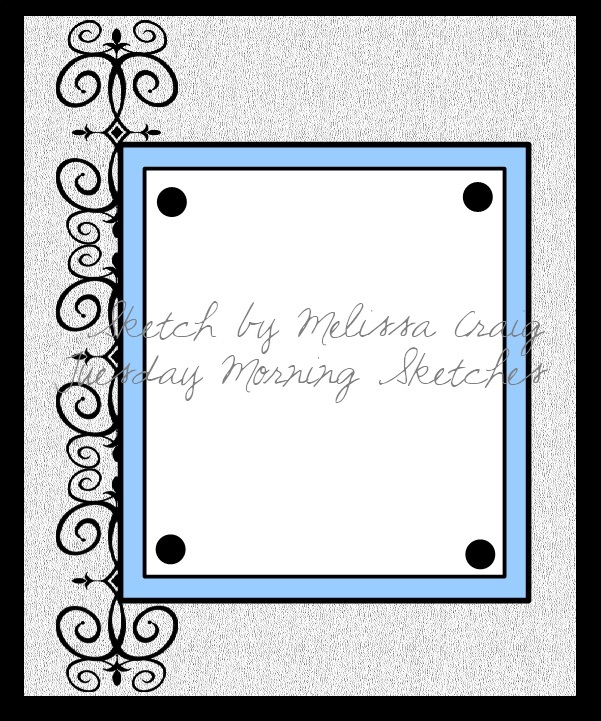 I loved this sketch and it worked so well with a sweet and cozy set. 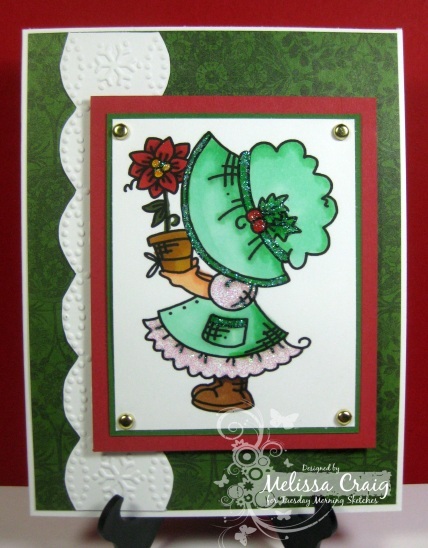 This card features new sets called Hats Off and Warm Sentiments. This was so easy to put together and so much fun. 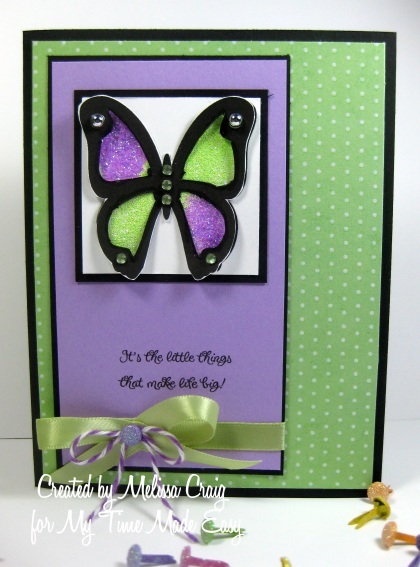 My card also features the color combo challenge from There She Goes stamps. My sister is hosting this week's challenge, so I definitely wanted to play along. I hope that you join us this week - come on.... it'll be fun! Hello there! Having a good week? Me, too. I know this kind of challenge is loved by everyone because there are no limitations. So, you can create whatever you like and it'll fit this challenge. 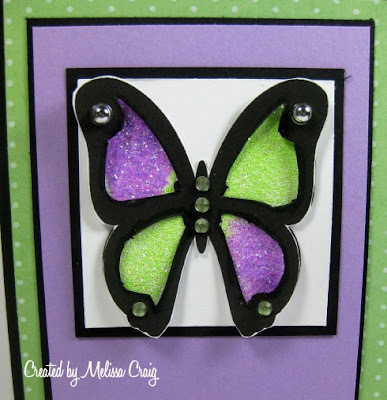 I created a card using a tutorial on SCS for a Crimped Diamond card. This was harder than I thought it would be, but the results are worth it. I love this card. 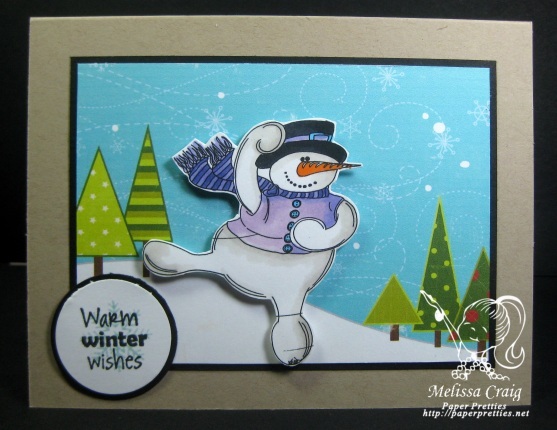 Of course, this SUPER ADORABLE image from Digital Delights by Louby Loo Flurry the Snowman can't help but make any card look fanstastic. Agreed? Yeah, I thought so. 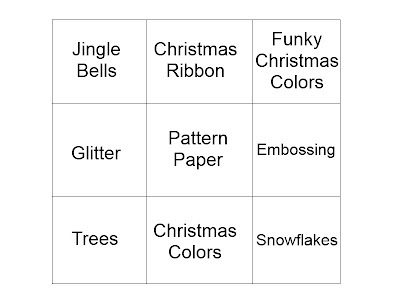 This will be the last challenge until January. You'll still see me around playing on my blog, but maybe not so much while I enjoy the holiday with my children and gear up for January! Hi everyone! Happy Friday to you. Well, the craft sale last night didn't go so well. I sold one pack of cards. I'm a little disappointed but am hopeful for tomorrow's sale. 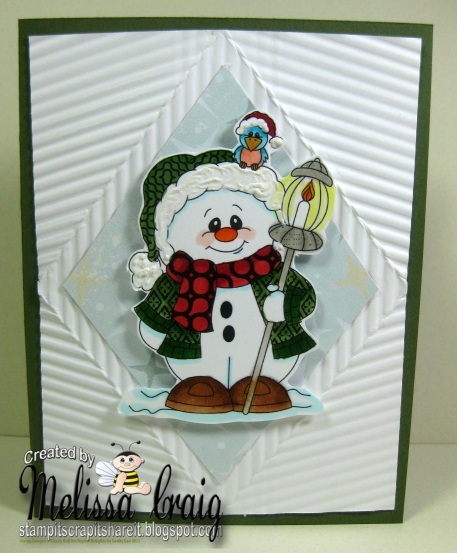 I have a card to share with you with because there were challenges that I didn't want to pass up. 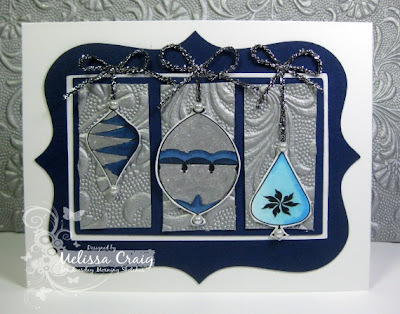 The layout is from a great sketch I found on Stampin' Royalty, the color combo is from Arielle's ColourQ (it's been way toooo long since I've played along), the iCopic Lover's challenge is black hair and the ATS Wednesday challenge is an Anything Goes. There's a great tutorial posted on the blog teaching how to create beautiful black hair. I failed miserably. I need so much more practice. 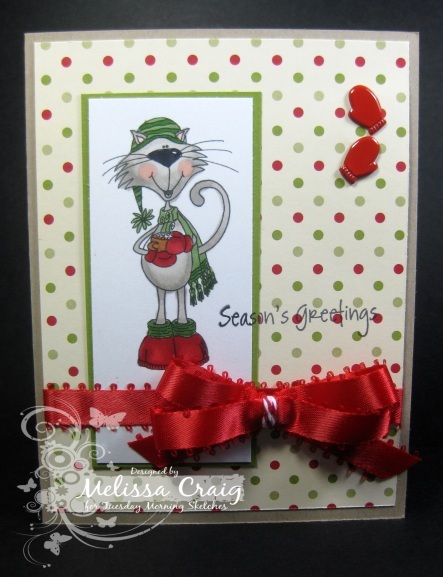 But I think my card is cute anyway. Hello again. Thanks for coming back. 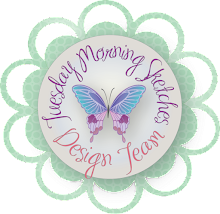 If you're here to see my post for the MTME Pretty Patterns #39 challenge, just scroll down a bit. 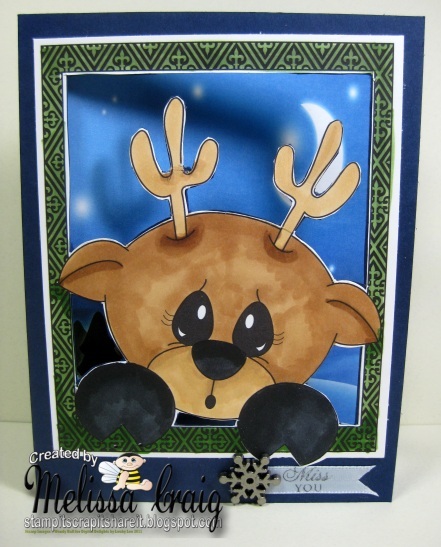 This front image is Window Reindeer. Now when I heard that challenge was Blue Christmas, I immediately thought of missing loved ones. So I imagine this little guy as looking into a window of his woodland friends' cabin, wondering when they were going to return. Even though the snowy fields and starry sky are quite peaceful and serene, it's ttttooo cccc-cold outside for our furry little friend. 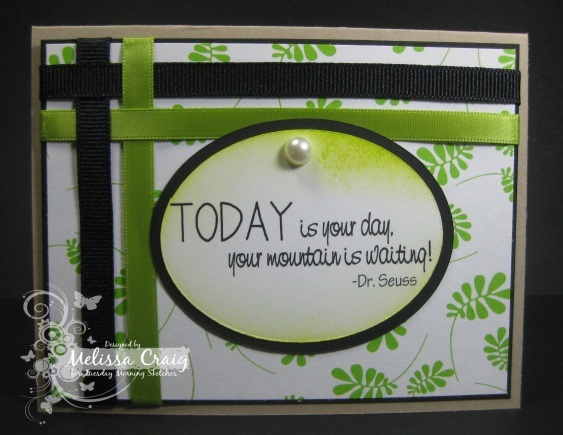 Join us won't you and please share your story behind your card. I'd love to hear it. Hello! Happy Friday everyone. 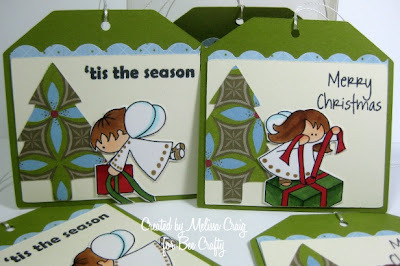 I completely forgot to post my adorable tags that I made for Bee Crafty's challenge this month. 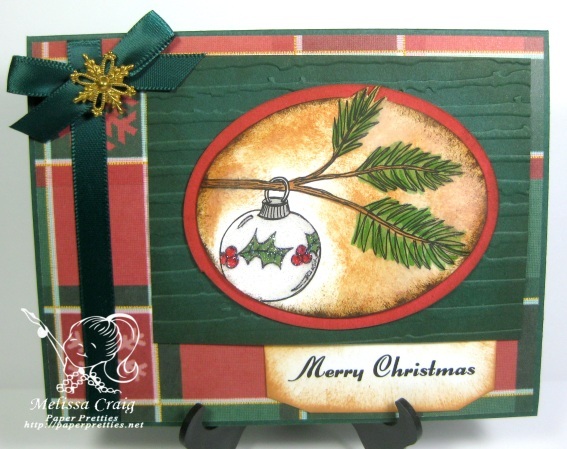 It's Christmas time, so we have a Christmas theme. 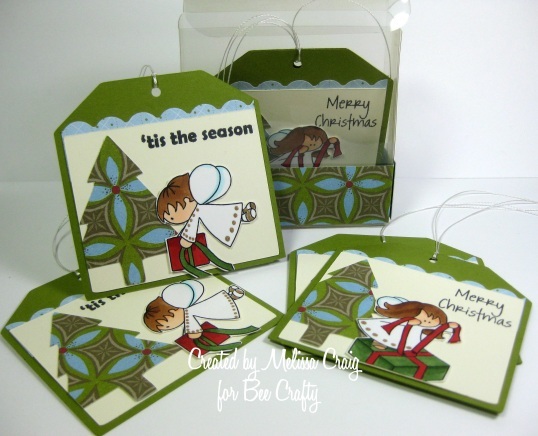 Here's what I made featuring the Wish Fairies - Christmas images. I love my tag set! 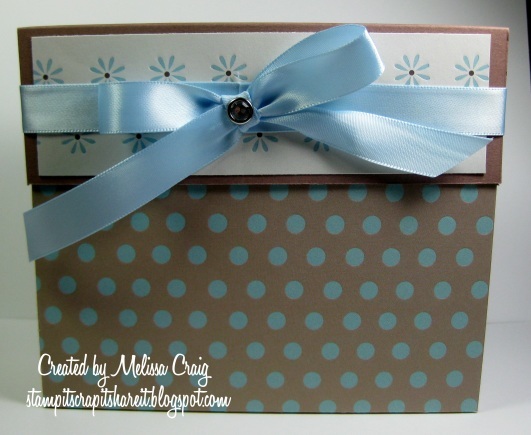 I even made the matching clear box. That was a little tricky to figure out, but I after about 3 or 4 tries, I got it figured out. Here's the close up of the tags. 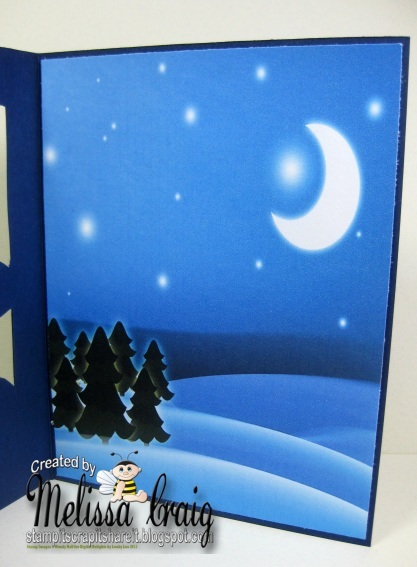 Head on over to Bee Crafty to play along with us. Good Morning! 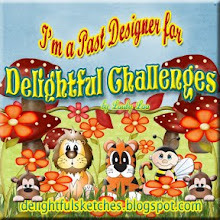 If you're here my Delightful Challenges post, please scroll down. This week at My Time Made Easy, we're playing with past sketches. I chose Pretty Pattern #21 to play with. 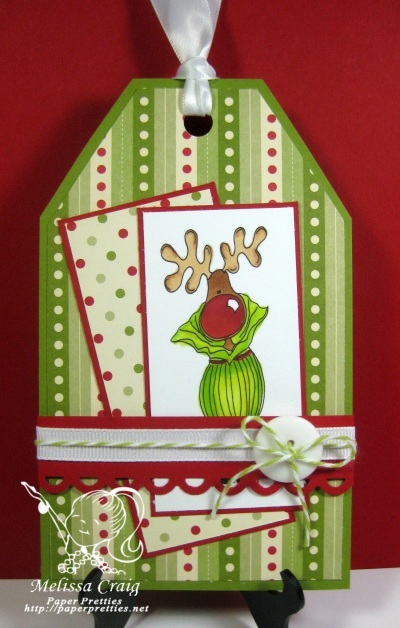 My cards features a sweet image from Holly Jolly and Mrs. Candy Claus digi paper. 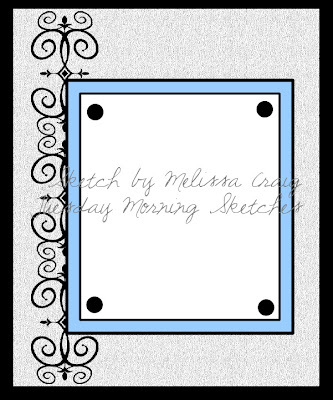 I love this sketch - so easy! I did a CAS card letting the paper and image speak for itself. I am really pleased with it. I hope you like it, too. 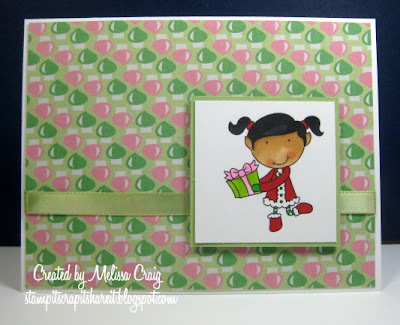 Join us at My Time Made Easy - Pretty Patterns. You'll really enjoy yourself, I promise!